We will pick you up at Surabaya Airport, Hotel or Train Station as the agreement and drive you about 4hour to cemorolawang village for check in hotel at mount bromo area volcano Free Program. At 03.30am, we will start driving to go to the most famous view point in the world at Mt.Pananjakan (2774 m) of the Tengger Caldera. 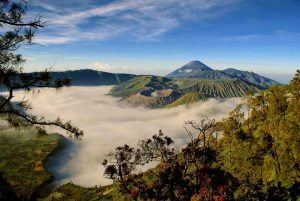 Here, we will see dramatical sunrise and panorama with five mountains in the Tengger crater and an active Mt.Semeru (3676 m)than back to the same jeep we will going to sand of sea visit bromo crater by walk or horse riding After that continue driving to Surabaya Hotel/Airport drop service and program mount bromo tour package 2d 1n is ended.